At WhiteWall, you can create a Photo Calendar of unforgettable moments. Including the cover, there are 13 pages to present your best photographs. Celebrate an anniversary throughout the year, relive fond wedding memories, or create perfect gifts for your favourite clients. Using outstanding, brand-name paper and meticulous printing techniques, we meet professional standards with our wall calendars. You are looking for the largest calendar format on the market without compromising on quality for your photos? In this case, our new XXL FineArt calendar is just right for you. The FineArt speciality paper is matte and has a subtly textured surface. A special primer treatment ensures a pleasantly coarse feel and the increased paper volume (320 g/m²) makes the calendar particularly stable in spite of the XXL format. 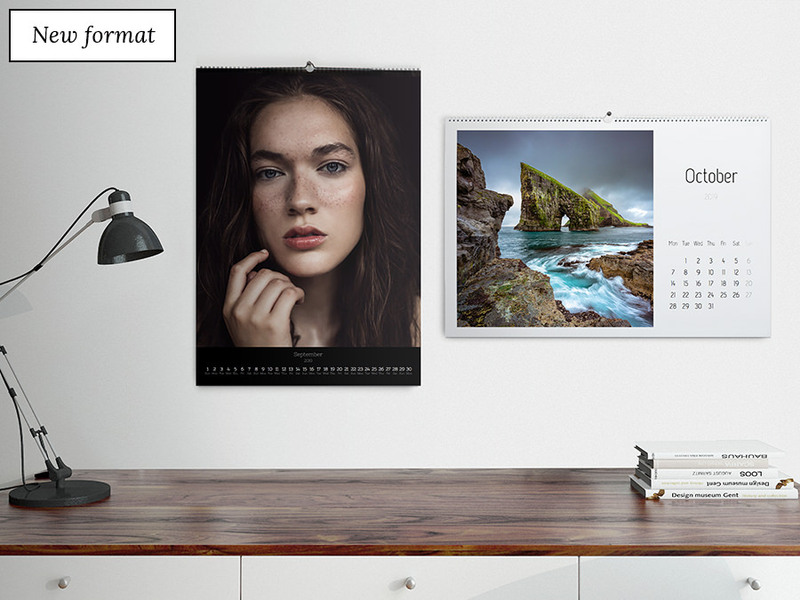 Available in portrait or landscape format, the FineArt calendar ensures an artful presentation of your photos. To make sure your photographs have the intended effect in your wall calendar, you can choose from 10 different format options. No matter if you opt for A5, A4, A3, A2, XXL, no matter if you prefer portrait or landscape orientation, or no matter if you want a square calendar – we will realize your vision precisely. WhiteWall owes the impressive quality of its premium digital prints to the latest technology and techniques. We print your personalised Photo Calendar with great care and high resolution, so that we can guarantee crisp details, true colours, and luminosity. To do justice to your creativity and expectations, we have developed different design templates for you to simply and easily design your own Photo Calendar. From classical elegance to modern, they are always stylish and aesthetically pleasing. The number of photographs and which page they appear on is entirely up to you. Select the calendar style you want, the starting month, a complementary font, and an individual background to brighten up the whole year for you and others. Select the calendar style you want, add text in a fitting font, and customise the background. The spiral binding comes in three colours: black, white, or silver. Create your personal Photo Calendar now and give yourself or someone special a whole year of joy! With our modern software, you can create your personal 2019 wall calendar in no time flat. Add your favourite photos to your selected layout directly through the website. Add comments or personal notes, and adjust the templates as necessary for your calendar’s format. That’s it! Your custom calendar is finished. It's easy to pick up editing right where you left off. Saved Photo Calendars will be available in your WhiteWall account for 45 days. Photo Calendars you have ordered will be saved in your account for 200 days. With WhiteWall, it is easy for you to realize your exact ideas for a personalised 2019 wall calendar. WhiteWall is not just about delivering the highest quality results, but also committed to providing excellent service. 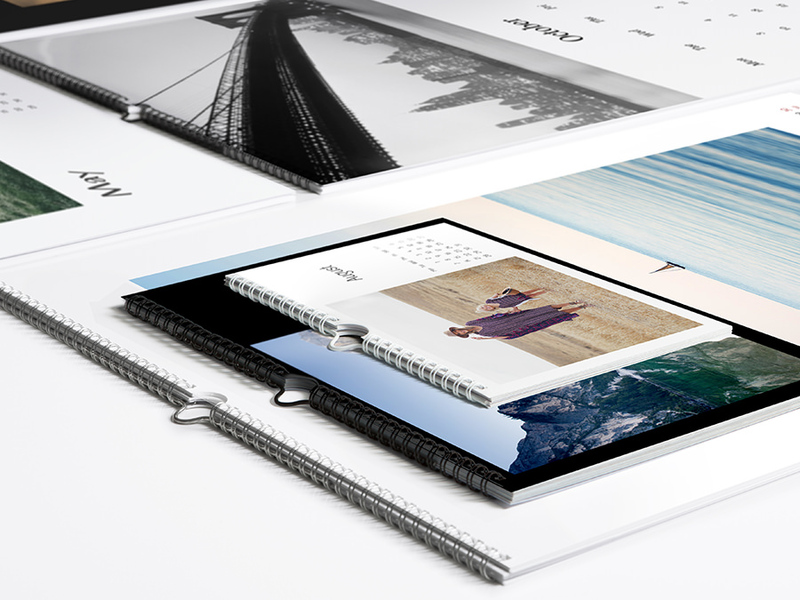 With our design templates and easy to use Photo Calendar software, you can turn your photos into 12 incomparable months and a cover in the size of your choice: A5, A3 or A2, to XXL in portrait or landscape orientation, or even panorama. 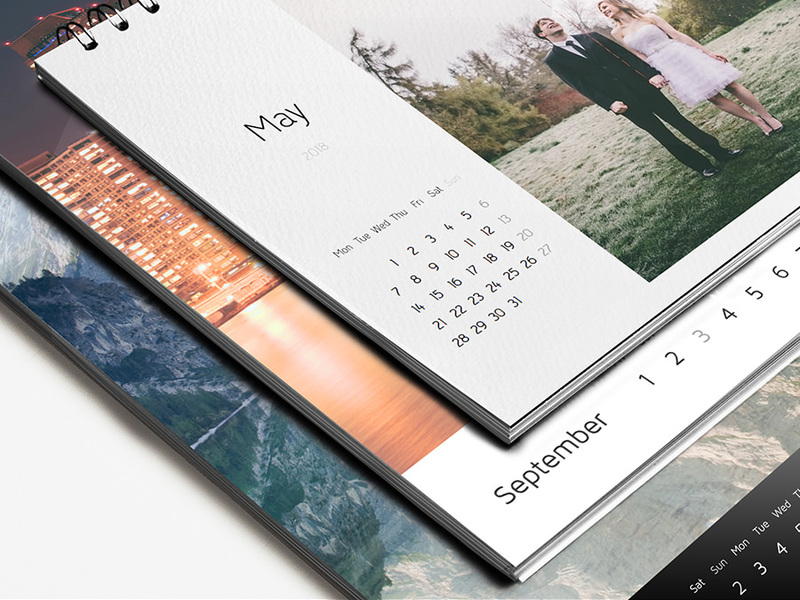 Step by step and online, you create the exact Photo Calendar to suit your best photos. 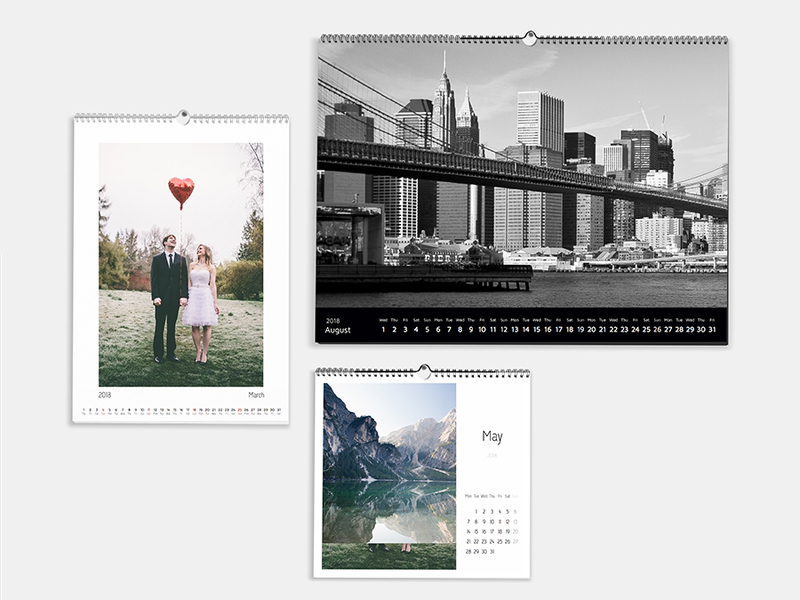 Whether you pick images thematically linked to the months and seasons, or you simply want to immortalise a wedding or anniversary, we help you transform your memories into an unforgettable wall calendar. By selecting the individual components for your unique Photo Calendar, you can easily realise your personal vision. For our large sizes, landscapes, portraits or very large, we recommend high-resolution photographs if you want to avoid pixels or lack of sharpness. The papers give your images additional expressive power. Choose high gloss or silk matte, powerful colours or notable reserve, according to your preferences. Our panorama format is fantastic for landscape shots, but a square format can also really emphasize nature shots. Deciding where you want to display your calendar and what size will match the room’s furnishings can be very helpful when selecting a format. At WhiteWall, we offer 10 different formats, 4 brand-name papers, and spiral bindings in your choice of black, silver or white: Over 100 possibilities to make your own beautiful 2019 Photo Calendar. Our user-friendly software enables you to instantly create the perfect gifts for family, friends or clients. In addition to the format, you can choose the paper, design, and starting month to make the most of your ideas and turn our templates into an exclusive Photo Calendar. Portrait orientation, landscape orientation, small, large, or even XXL; with the holidays and important dates marked or without; with text or with a straightforward photo design – let WhiteWall inspire you to create your own wall calendar. In small standard and large landscape or portrait sizes, your calendar will make a big impression thanks to the premium quality work we do using the latest technology and skilled craftsmanship. Create the calendar of your dreams and we will deliver it to the address of your choice to spread joy for the next 12 months.